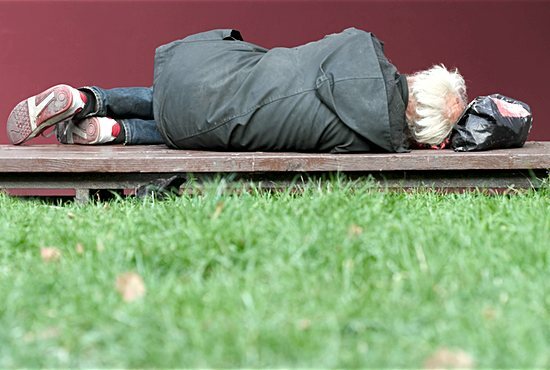 Each morning, when I would take a walk around the hotel where I was staying downtown, I would see homeless people asleep on benches or in doorways or in parks. And very often right next to them would be food or a beverage — not their own food but a token of encouragement that had been left by passersby on the sidewalk, so that they’d have something to eat when they awoke. It was a sight that I have never seen in the United States, but it seems to be part of the culture there, a culture that seems to understand that poor people have a claim on the rest of us by the simple fact of their being there. I have to assume that the people who left those offerings didn’t know the names or life stories of those sleeping people, but it didn’t matter. Nobody was required to explain how they ended up on the streets, no morality examination. I suppose some of them had behaved exceedingly badly or had made very poor life choices, and some of them were simply unlucky or unwell or survivors of tragedies. It didn’t matter. There they were, and they were going to be hungry when they stirred for a new day. So here was one less thing for them to have to worry about, at least for a while. I thought of those people in reflecting upon the story, in the first reading of the 19th Sunday in Ordinary Time, of Elijah, there asleep under the broom tree in Beer Sheba in the desert. He had tried to carry out the Lord’s command to prophesy, and he believed that he had failed. He was tired. He was depressed. He ran away to a lonely place and prayed for death. Then he fell asleep and awoke to find food and drink at his head, gifts which somebody had left there. We are not told who did that. The angel of the Lord was there to rouse him from sleep and to command him to eat and drink, but curiously — very curiously — the story doesn’t say that it was the angel that brought the food or the water. I wonder who did. And I wonder if that isn’t the point. Elijah believed that his life was useless, and that he no longer had any productive purpose for remaining on this earth. A lot of people today feel the same way about homeless people. And in both cases, God thought otherwise. God had a plan in mind for such a person as Elijah, and God still does have a plan for each and every one of us — including the very most down and out among us. The fact that we may not understand that plan is really not very important at all. But that hungry person still has to be able to eat if any sort of plan is to be realized, and that is a situation that most of us are in a position to do something about. I’m sure that the anonymous donors on the streets of Toronto are under no illusions that they are transforming the world by their simple gifts, but they are responding to the opportunity before them at the moment, which is more than I’ve seen in any other city, ever. We who presume to carry the name “Christian” have to care about all those people as much as God does. Father Byron is pastor of Pax Christi in Eden Prairie.